Across the country Australians are being offered free tools and training to help them get online. home – that involve using digital technology. You send emails with attachments, you post photos and share news with family and friends on social media, you check the weather, look up recipes, you might do banking, book holidays or apply for jobs online. You might also participate in online learning, pay your council rates online or access health services on the internet. But for many Australians these are not skills that they can take for granted. These are the digitally disadvantaged – people on the other side of the digital divide. According to a 2010–2011 report by the Australian Bureau of Statistics, approximately 21 per cent of Australians do not use the internet and this figure increases to 63 per cent for people aged over 65. Kaet Lovell, Assistant Director of the Digital Policy Section in the Federal Government’s Department of Communications says that the digital divide is not just an age issue. ‘Adults who left school before 2000 when computers were introduced in classrooms, people who have had no need to use computers in their jobs, and stay-at-home parents – are all people for whom computers have just not been part of their world.’ The high income and highly literate can be just as vulnerable to digital disadvantage, Kaet says. But some groups including people with disabilities, are doubly disadvantaged. Kaet says the cost of not participating in the digital world can be high. People with little or no digital literacy have unequal access to services and information. The Australian Government offers a number of free tools and resources to help Australians get online and make the most of the internet – safely and confidently. The Internet Basics website and the Digital Hubs program aim to increase the number of Australians who use the internet and to train those people at risk of being left behind in using digital technology. Internet Basics offers online help in learning to use the internet safely and easily and to increase awareness of the benefits of being online. Digital hubs are operated by 40 community organisations around Australia including councils, libraries, community centres and neighbourhood houses. They offer free individual and group training to local community members. 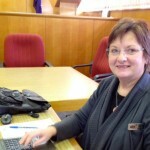 Trish joined the Adelaide Hills Digital Hub team in February 2013 and thoroughly enjoys her role. ‘The most rewarding thing about working for the Digital Hubs program is the ability to help people resolve their frustrations with technology, and connect with others online’, says Trish. With her teammates, Trish plans training that is relevant to the needs of their community. ‘It can get very cold during winter in the Hills, so there are lots of people who travel to escape the cold. We have sessions that teach people how to book travel, stay in touch with their family while they are away, and then how to edit their photos when they return. You can watch a short video about the Adelaide Hills Digital Hub on YouTube. 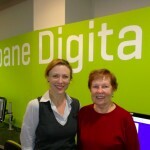 Jane and trainee at Brisbane Digital Hub. 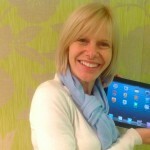 As the Digital Hub trainer, Jane finds showcasing technology exciting. She says, ‘I love that light-bulb moment – the ‘aha!’ when you know people really understand something they have never understood before’. One of Joan’s relatives suggested the Digital Hub as a way of improving her limited computer knowledge. Joan learnt how to use Facebook, and a range of IPhone apps. She can now monitor her diabetes online, which has helped her feel more in control and less stressed about her health. She also has more regular contact with her family through email and social media. The Digital Hubs website has details of all 40 digital hubs around Australia.